When Martyn Blayney last visited King's College School it was to play cricket as a schoolboy. He was not to know that the birth of a baby, a few years before, would shape the rest of his life. Now, as Bourn Hall’s Science Director, he was invited back to the school to talk to pupils about reproductive medicine and 40 years of IVF. 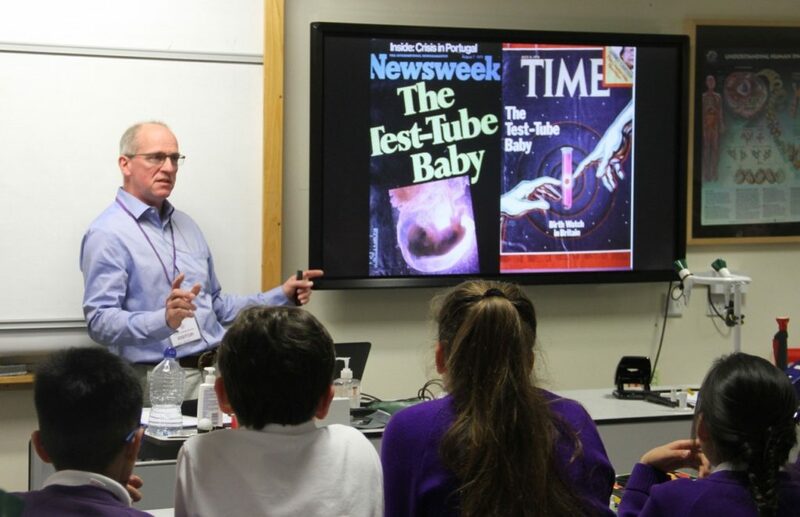 In this momentous year for IVF, its 40th anniversary, I was particularly pleased to be asked to talk to Year 7. I am passionate about the history of my profession, and take every opportunity to describe the difficulties, challenges, opposition and set backs suffered by Patrick Steptoe, Robert Edwards and Jean Purdy in the 10 years of research carried out before Louise Brown’s birth. I shared how the trio went on to found Bourn Hall Clinic and the pioneering role it has had in developing fertility treatments – the success of which have improved year on year ever since. The magnitude of this achievement was finally recognised in 2010, when Professor Edwards was awarded the Nobel Prize for Medicine. Many of the students were already aware of IVF and some other fertility procedures, as they are quite a commonplace nowadays, but it is also important that they understand how unusual – and controversial – IVF was at the start. Sharing how the attitudes towards IVF have changed offers an insight into how quickly the world of science and social norms can progress. I think knowing about this area of medicine helps with their understanding of broader science, and gives them context of how their scientific knowledge can be used in the wider world. The Year 7s had previously been learning about reproduction and had looked briefly into fertility practices. I highlighted the most common causes of infertility and explained how IVF and other fertility procedures help to overcome them. I also took the opportunity to impart an important and often overlooked message to the students, namely that female fertility declines dramatically with age. My talk couldn’t pass without mention of Louise Brown, the world’s first ‘test tube’ baby, who celebrates her 40th birthday on 25th July this year and the important fact that she has 2 naturally conceived children of her own. It was wonderful to go back to King’s College. The last time I visited was in the 1980s, a few years after Louise Brown was born, as part of the Perse School Cricket XI. Louise’s birth was pivotal in leading the way for countless more IVF babies – 6 million and counting – and the development of new fertility procedures. Bourn Hall continues to progress IVF research today. I really enjoyed talking to the students who were very interested and it was nice to see how easily they picked up new knowledge. Given their enthusiasm, I hope I have inspired some future embryologists. Martyn is part of Bourn Hall’s Senior management team – and you can find out more about our Bourn Hall family, who work across our six clinics covering the East of England, on the Meet our family page. Detailed information about IVF and the range of treatments we offer is available on our IVF treatments page or you can contact one of our team to discuss how we can support you on your journey to parenthood. For more about Bourn Hall’s activities, please visit our regularly updated Fertility blog.